Bhopal: Experts, civil society organisations and farmers came together and held a joint consultation in the State capital today (28 Sept 2018) to develop a Strategic Framework for agriculture solutions in the Bundelkhand region. Bundelkhand region has become synonymous with drought and poverty in spite of multi-sectoral efforts in the past. The region continues to be stressed due to variability in rainfall and longer dry spells. As a result, seasonal migration for work, extreme forms of malnourishment; and insecurity of stable income and decent livelihood are some of the key development challenges confronting the region. The prevailing scenario necessitates the need to devise specialized solutions for chrinic water shortage areas like Bundelkhand and develop systemic changes that would address the problems of Bundelkhand farmers. To develop a new vision of agriculture development in Bundelkhand through established proof of concepts and Influence policy for climate resilient agriculture, a day-long consultation was organised here today. 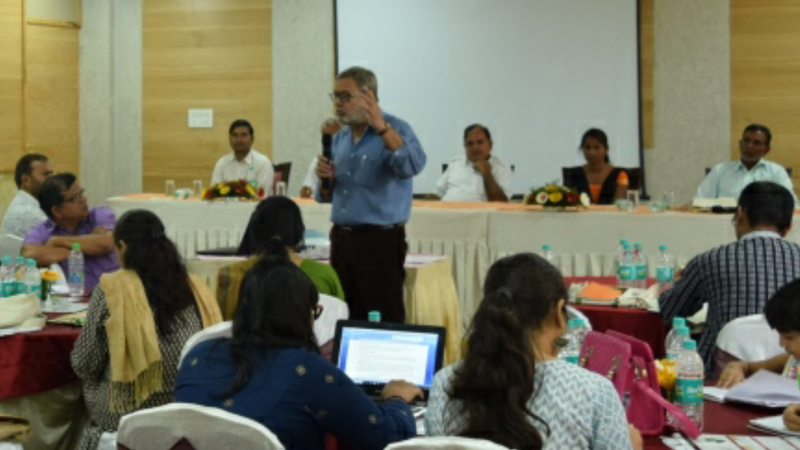 It had participants from several civil society organisations such as Development Alternatives (DA), People science Institute, Ekta Parishad, Bundelkhand Sewa Sansthan & technical agencies like INTACH and RRAN network (WASSAN). Senior officials from the Department of Agriculture and NABARD also participated in the consultation. Sharing about the need for an alternative framework of Investment in Bundelkhand for rain-fed regions, Chandan Mishra, Deputy Programme Director, Development Alternatives, said that, the programme focuses on risk reduction, ease of doing farming and enhancing income growth for small holder farmers. “A bottom’s up approach that strengthens farmers based institutions and builds them to become a mediator for small holder and marginal farmers, to engage with government, markets can enable a more holistic approach towards agriculture solutions in rain-fed regions of Bundelkhand,” he added. The objective of the meeting was to make rainfed agriculture more productive and sustainable & advocate favorable policy for the rainfed regions. It was emphasized during the consultation that there is a need to develop a Strategic Framework to improve the agriculture sector in Bundelkhand, as a solution for reducing migration and improving food and livelihood security of small holds farmers. Also, develop & pilot Innovative models for rainfed farming through learning and action research, and create a platform for advocacy by using the collective strength of CSOs’ working in Bundelkhand. It was also outlined during the consultation that the problems in the region could be divided into 5 thematic areas i.e. seed systems, soil, water, livestock and agronomy and they need specific approaches to tackle them. These include developing a decentralized, self sustainable seed system, critical irrigation and water sharing mechanisms, soil management with focus on soil organic matter and healthy livestock with focus on nutrition, vaccination and housing.